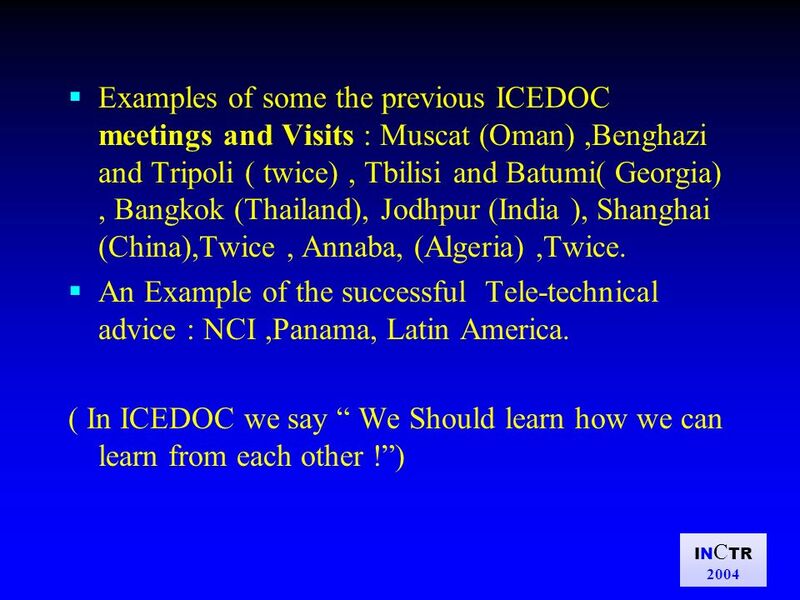 IN C TR 2004 The Global Perspective of ICEDOC on cancer control for underserved regions in the world Ahmed Elzawawy, Egypt Web : ICEDOC.ORG. E-mail: ICEDOC. 2 IN C TR 2004 Here, I introduce some examples of my positions and titles, not at all to show myself. In fact a president of an organization formed of distinguished international volunteer, is the most available servant for his colleagues. But, it shows that it is not contradictory-at all- to be active and loyal in more than one imitative and organization against cancer. We should cooperate more and more together. 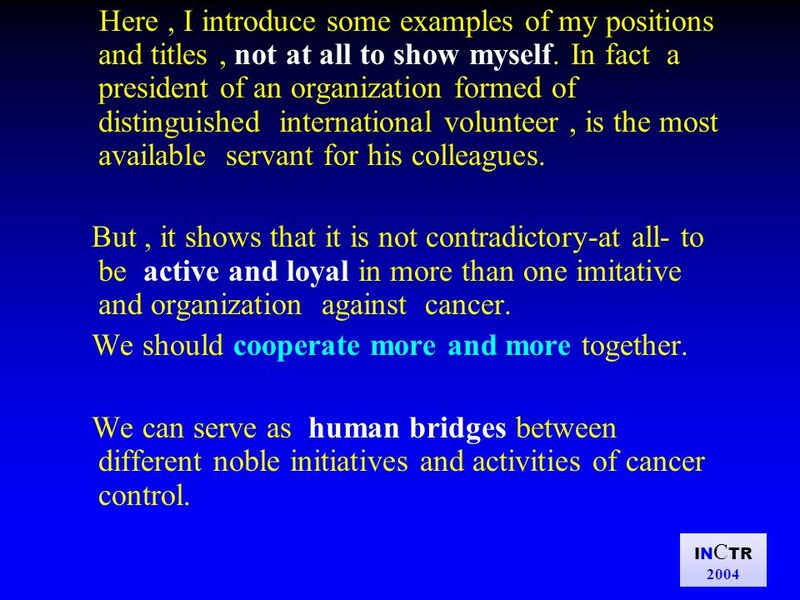 We can serve as human bridges between different noble initiatives and activities of cancer control. 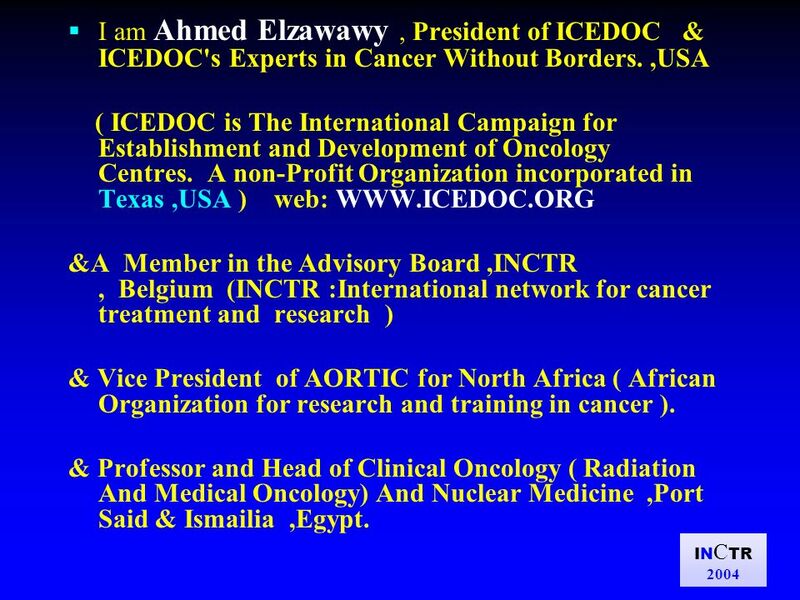 3 IN C TR 2004 I am Ahmed Elzawawy, President of ICEDOC & ICEDOC's Experts in Cancer Without Borders.,USA ( ICEDOC is The International Campaign for Establishment and Development of Oncology Centres. 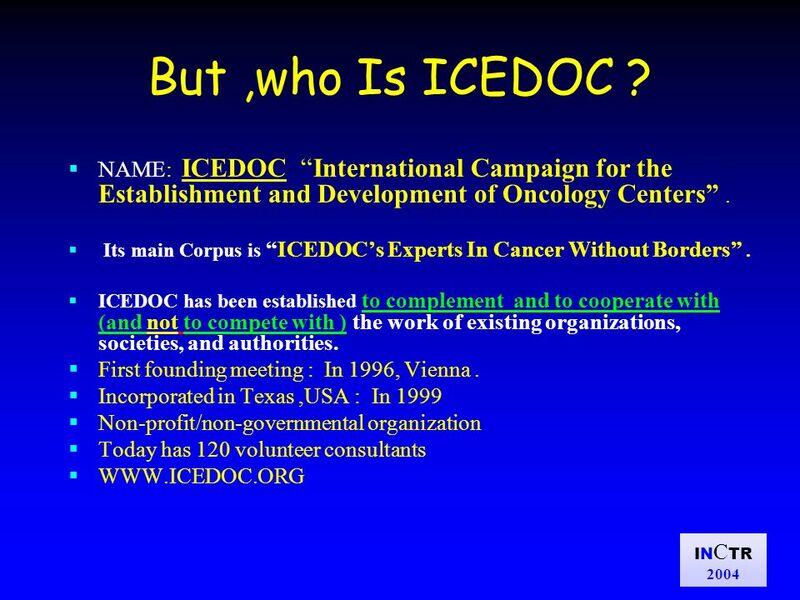 A non-Profit Organization incorporated in Texas,USA ) web: WWW.ICEDOC.ORG &A Member in the Advisory Board,INCTR, Belgium (INCTR :International network for cancer treatment and research ) & Vice President of AORTIC for North Africa ( African Organization for research and training in cancer ). & Professor and Head of Clinical Oncology ( Radiation And Medical Oncology) And Nuclear Medicine,Port Said & Ismailia,Egypt. 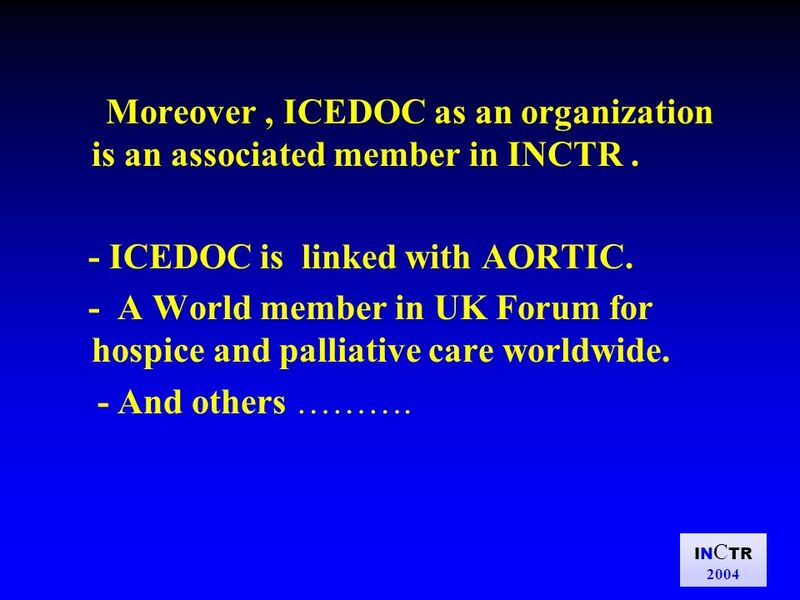 4 IN C TR 2004 Moreover, ICEDOC as an organization is an associated member in INCTR. - ICEDOC is linked with AORTIC. - A World member in UK Forum for hospice and palliative care worldwide. - And others ………. 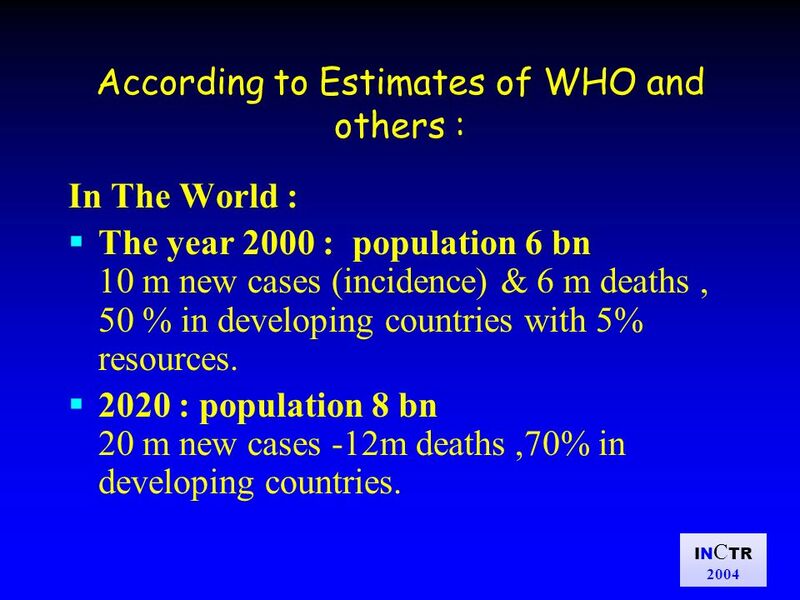 5 IN C TR 2004 According to Estimates of WHO and others : In The World : The year 2000 : population 6 bn 10 m new cases (incidence) & 6 m deaths, 50 % in developing countries with 5% resources. 2020 : population 8 bn 20 m new cases -12m deaths,70% in developing countries. 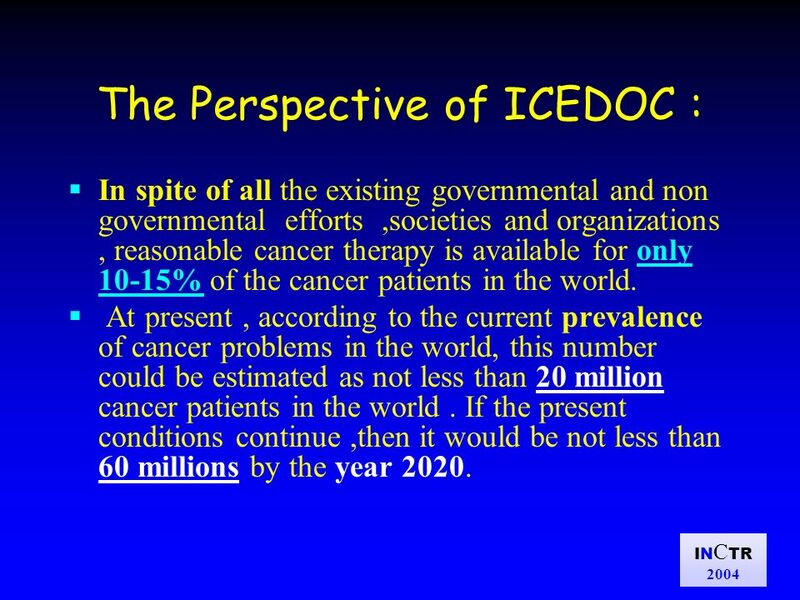 6 IN C TR 2004 The Perspective of ICEDOC : In spite of all the existing governmental and non governmental efforts,societies and organizations, reasonable cancer therapy is available for only 10-15% of the cancer patients in the world. At present, according to the current prevalence of cancer problems in the world, this number could be estimated as not less than 20 million cancer patients in the world. If the present conditions continue,then it would be not less than 60 millions by the year 2020. 7 IN C TR 2004 Cancer problems do not only touch patients, but also their families and friends who suffer for them. 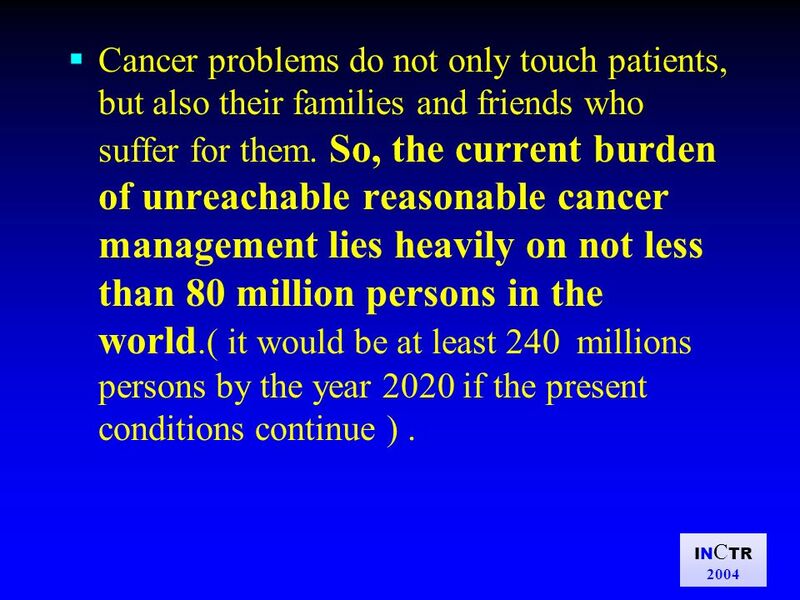 So, the current burden of unreachable reasonable cancer management lies heavily on not less than 80 million persons in the world. ( it would be at least 240 millions persons by the year 2020 if the present conditions continue ). 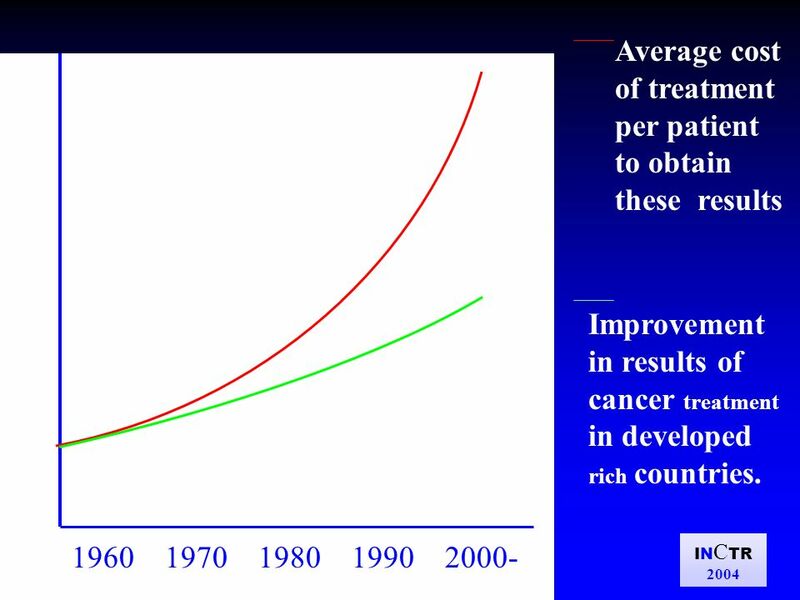 9 IN C TR 2004 1960 1970 1980 1990 2000- Average cost of treatment per patient to obtain these results Improvement in results of cancer treatment in developed rich countries. 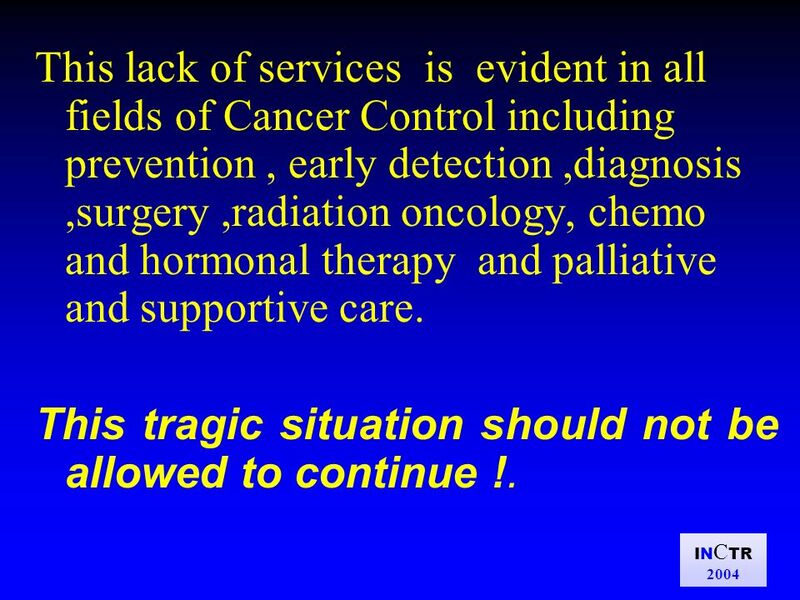 10 IN C TR 2004 This lack of services is evident in all fields of Cancer Control including prevention, early detection,diagnosis,surgery,radiation oncology, chemo and hormonal therapy and palliative and supportive care. This tragic situation should not be allowed to continue !. 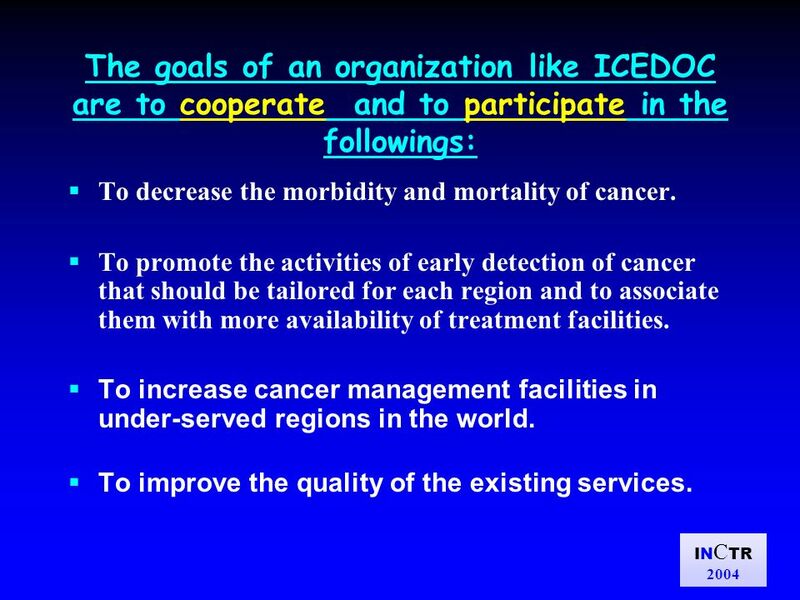 13 IN C TR 2004 The goals of an organization like ICEDOC are to cooperate and to participate in the followings: To decrease the morbidity and mortality of cancer. To promote the activities of early detection of cancer that should be tailored for each region and to associate them with more availability of treatment facilities. 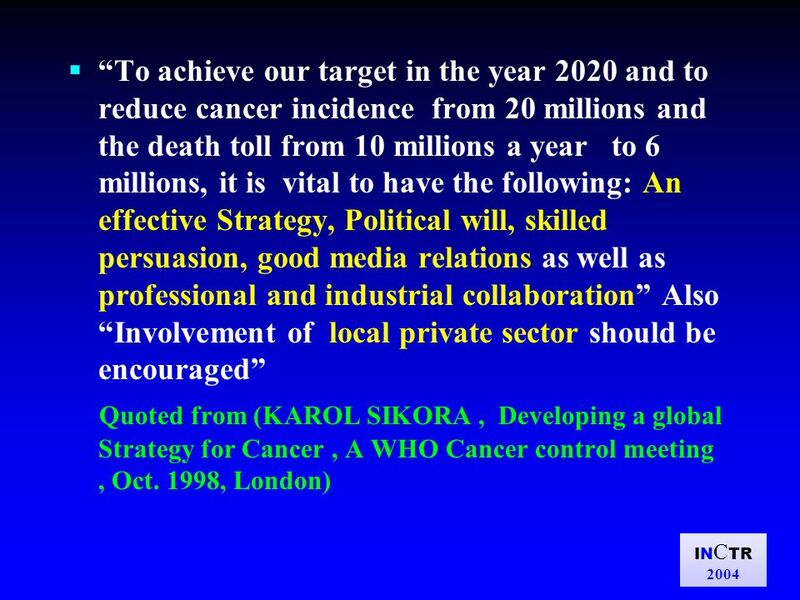 To increase cancer management facilities in under-served regions in the world. To improve the quality of the existing services. 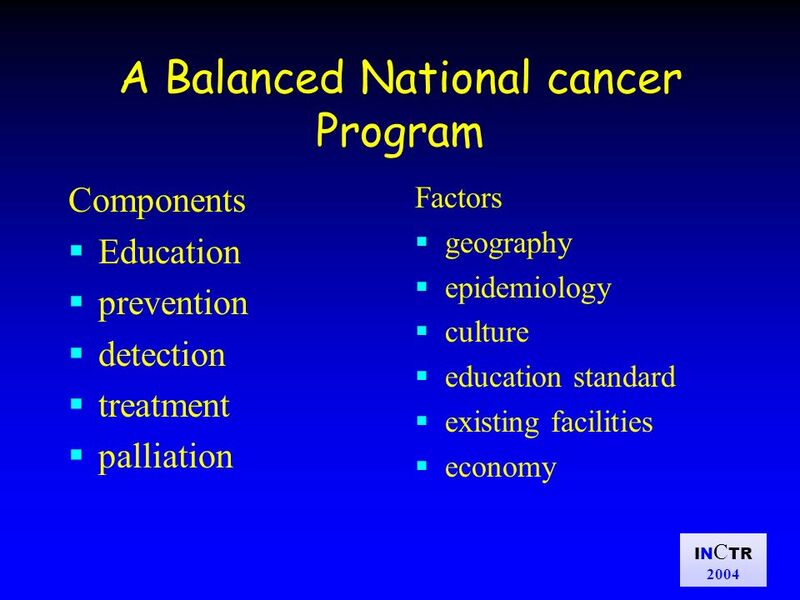 14 IN C TR 2004 To assist in tailoring cancer treatment protocols, modalities,departments and palliative care according to the specific conditions and the socio-economic factors in each region taking into consideration the views of the local health care providers and community. The final results should be within the range of acceptable international results. 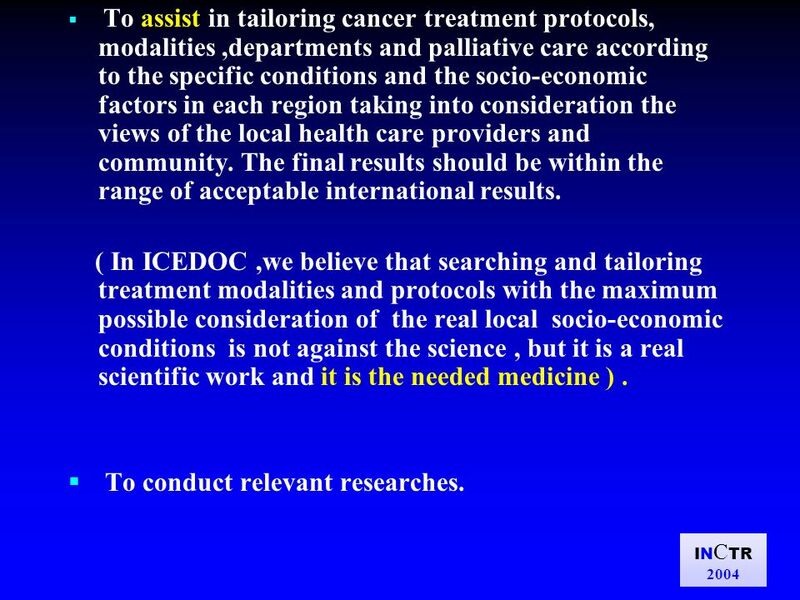 ( In ICEDOC,we believe that searching and tailoring treatment modalities and protocols with the maximum possible consideration of the real local socio-economic conditions is not against the science, but it is a real scientific work and it is the needed medicine ). To conduct relevant researches. 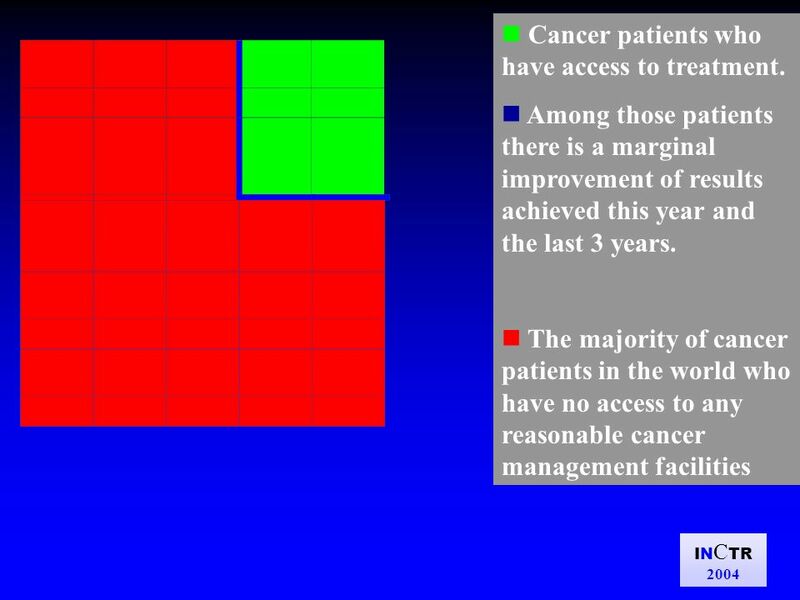 16 IN C TR 2004 MISSION This mission is derived from the fact that there are 85% of cancer patients in the world without access to cancer management. 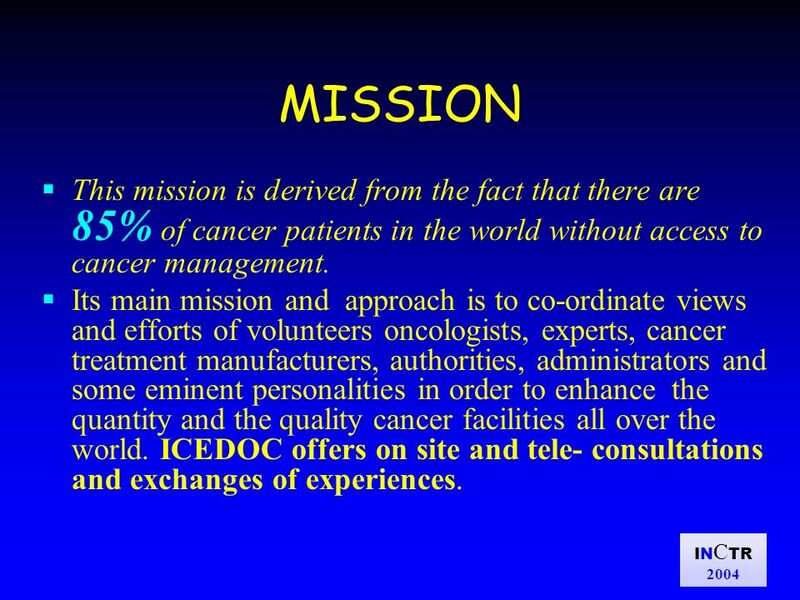 Its main mission and approach is to co-ordinate views and efforts of volunteers oncologists, experts, cancer treatment manufacturers, authorities, administrators and some eminent personalities in order to enhance the quantity and the quality cancer facilities all over the world. ICEDOC offers on site and tele- consultations and exchanges of experiences. 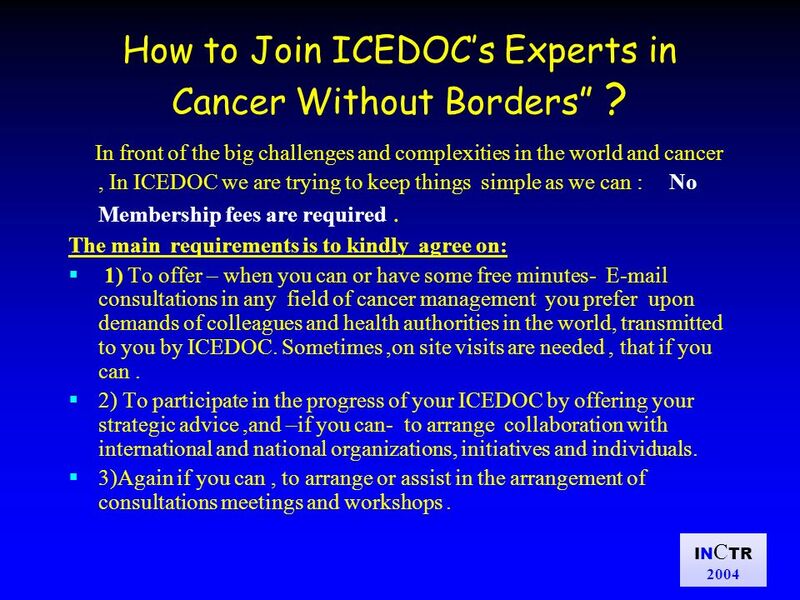 19 IN C TR 2004 How to Join ICEDOCs Experts in Cancer Without Borders ? 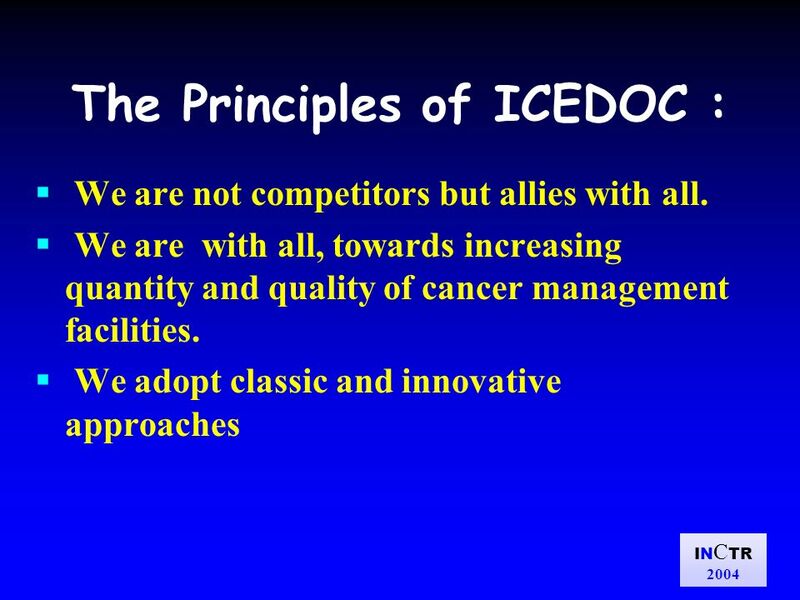 In front of the big challenges and complexities in the world and cancer, In ICEDOC we are trying to keep things simple as we can : No Membership fees are required. The main requirements is to kindly agree on: 1) To offer – when you can or have some free minutes- E-mail consultations in any field of cancer management you prefer upon demands of colleagues and health authorities in the world, transmitted to you by ICEDOC. Sometimes,on site visits are needed, that if you can. 2) To participate in the progress of your ICEDOC by offering your strategic advice,and –if you can- to arrange collaboration with international and national organizations, initiatives and individuals. 3)Again if you can, to arrange or assist in the arrangement of consultations meetings and workshops. 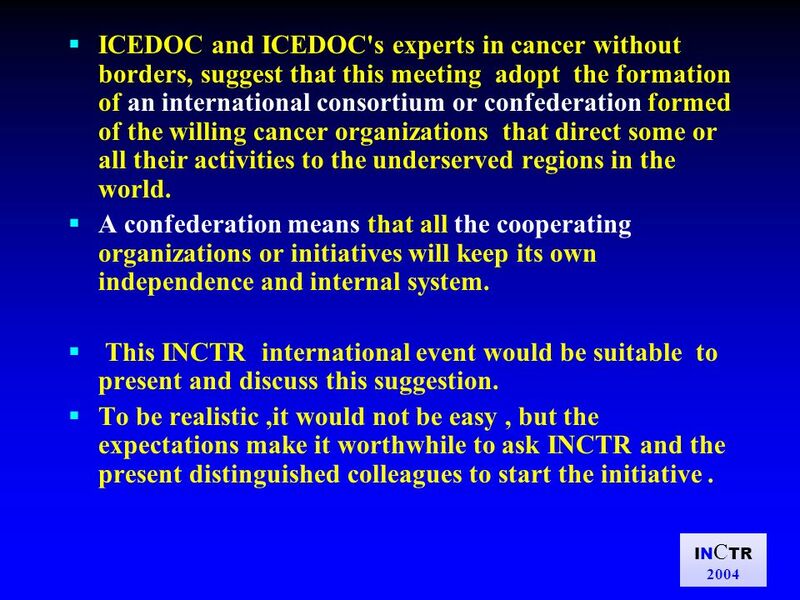 22 IN C TR 2004 ICEDOC and ICEDOC's experts in cancer without borders, suggest that this meeting adopt the formation of an international consortium or confederation formed of the willing cancer organizations that direct some or all their activities to the underserved regions in the world. A confederation means that all the cooperating organizations or initiatives will keep its own independence and internal system. This INCTR international event would be suitable to present and discuss this suggestion. To be realistic,it would not be easy, but the expectations make it worthwhile to ask INCTR and the present distinguished colleagues to start the initiative. 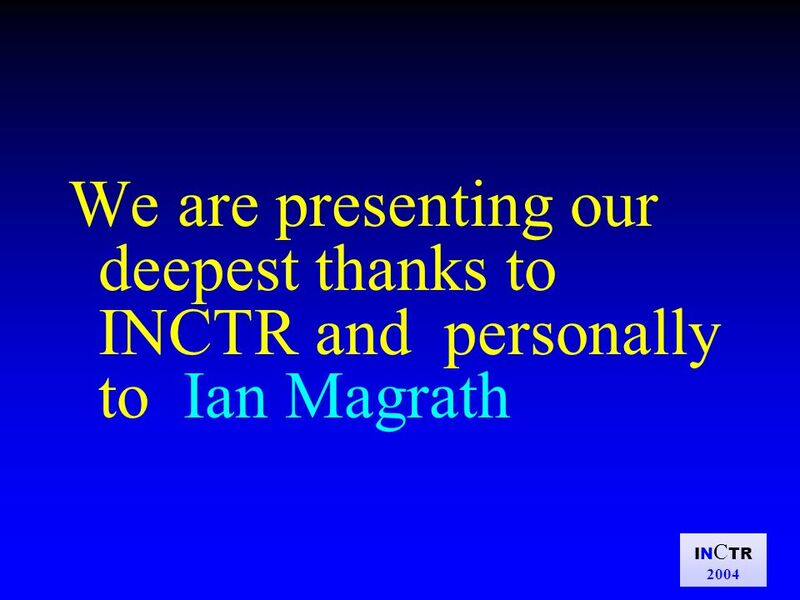 23 IN C TR 2004 What I presented today is on behalf of my dear colleagues in ICEDOC. 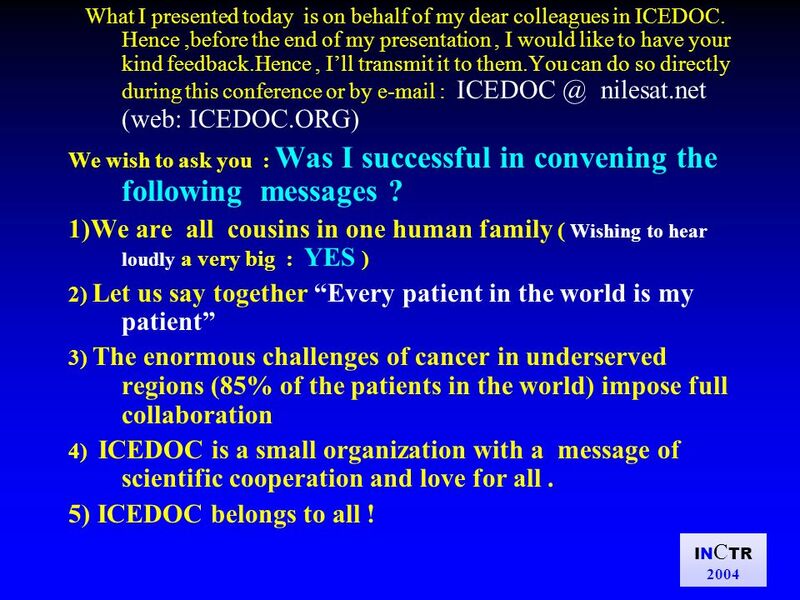 Hence,before the end of my presentation, I would like to have your kind feedback.Hence, Ill transmit it to them.You can do so directly during this conference or by e-mail : ICEDOC @ nilesat.net (web: ICEDOC.ORG) We wish to ask you : Was I successful in convening the following messages ? 1)We are all cousins in one human family ( Wishing to hear loudly a very big : YES ) 2) Let us say together Every patient in the world is my patient 3) The enormous challenges of cancer in underserved regions (85% of the patients in the world) impose full collaboration 4) ICEDOC is a small organization with a message of scientific cooperation and love for all. 5) ICEDOC belongs to all ! 24 IN C TR 2004 Finally, I feel that I hear from far the 1 st movement of the 9 th Symphony of Beethoven.In depth,it calls for love for all human beings. 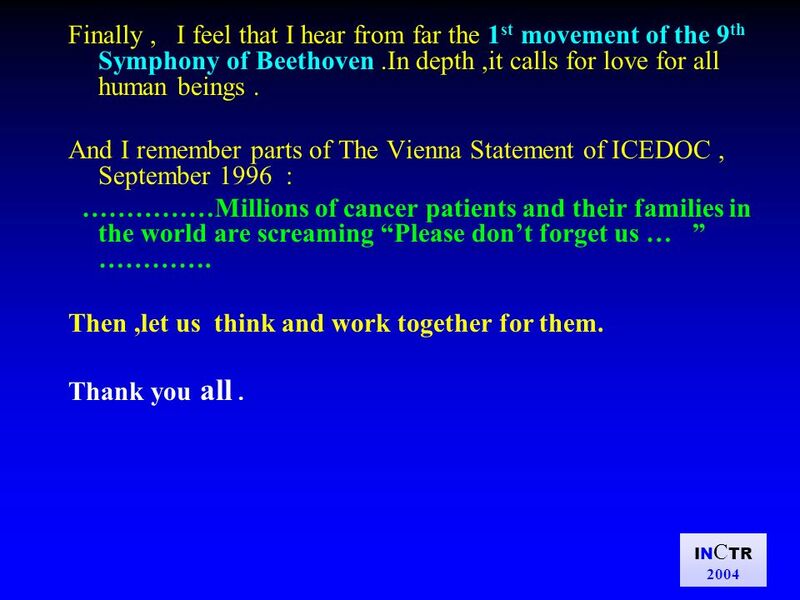 And I remember parts of The Vienna Statement of ICEDOC, September 1996 : ……………Millions of cancer patients and their families in the world are screaming Please dont forget us … …………. Then,let us think and work together for them. Thank you all. 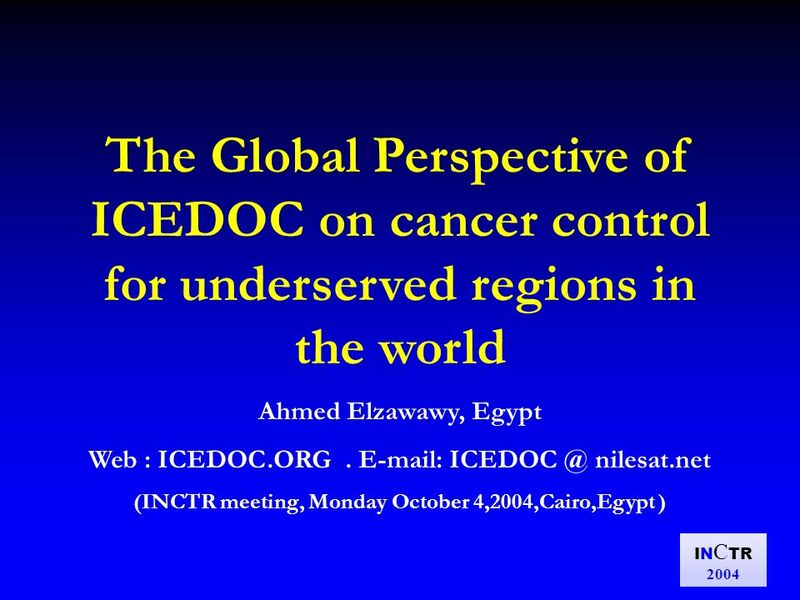 Download ppt "IN C TR 2004 The Global Perspective of ICEDOC on cancer control for underserved regions in the world Ahmed Elzawawy, Egypt Web : ICEDOC.ORG. E-mail: ICEDOC." Innovative Practice In Using ICT Working Together To Improve The Patient Journey Dr Roy Harper Consultant Physician and Endocrinologist The Ulster Hospital. Day 2 You receive 2 reports on your desk –The first describes the possibility of expanding the states newborn screening panel to include Severe Combined. Oral Health Promotion and Education Health" State of complete physical, emotional, and social well-being, not merely the absence of disease or infirmity"
Involving all health care providers in collaborative TB/HIV activities Eva Nathanson PPM subgroup meeting Cairo, Egypt, 3-5 June 2008. Promoting patient-centred healthcare around the world A patient perspective on the multiple policy initiatives: Lessons learnt – assessing the gaps Joanna. PATIENT EDUCATION: Patient Empowerment Maria A. Marzan, MPH Principle Associate, Family Medicine Associate Director, ICM.